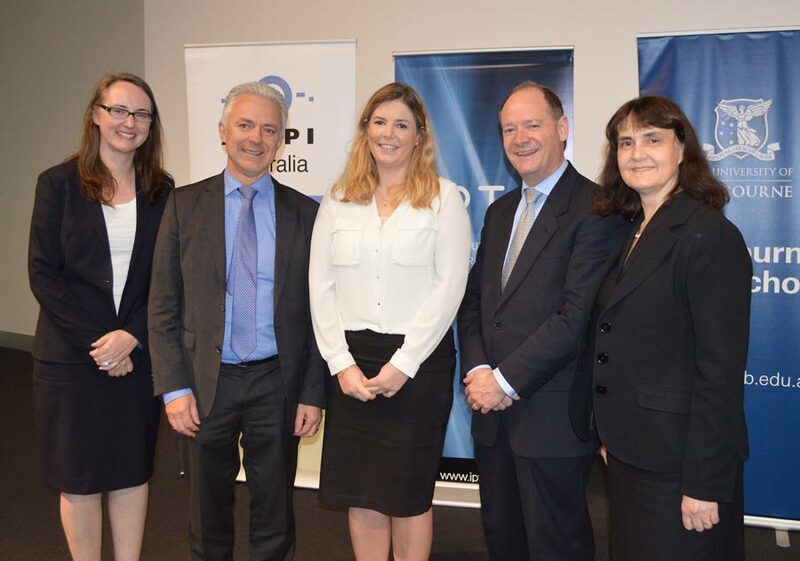 L-R: Janelle Borham, The Institute of Patent and Trade Mark Attorneys of Australia (IPTA), Michael Caine (IPTA), Pippa Hall, Professor Andrew Christie, MLS Dean Professor Carolyn Evans. Hall discussed intellectual property and the need to create a well-functioning intellectual property “eco-system,” in which the needs of individuals, government and the broader economy are all satisfied. Hall drew upon economic theory and data to analyse intellectual property laws both here and in her native United Kingdom. The lecture wove in the recently completed 12-month public inquiry by the Australian Productivity Commission into Australia’s IP system. Hall emphasised that such inquiries are healthy and productive, but need to be built upon solid foundations of research and collaboration. She welcomed the Commission’s focus on recasting the balance between incentivising innovation and enforcing IP laws fairly. When not escaping to the Australian summer, Hall is the Chief Economist at the United Kingdom’s Intellectual Property Office. The organisation is responsible for advising the British government on IP policy, monitoring the patent and copyrighting processes, and conducting research into the area. Hall also touched on her own experiences in the field, discussing some of the projects worked on by the UK IP Office. She impressed with the magnitude of the role her 15-person organisation plays in the IP system. The United Kingdom undertook its own IP reform in 2014, when it modernised its laws to better allow copyright holders and the owners of intellectual property to enforce their rights. Hall’s organisation has estimated that these sweeping reforms will help to contribute an additional £500 million to the British economy over the next 10 years. Hall spoke about how this area, in which law, economics and business collide, is too often neglected when governments look to stimulate or reform their economies. She spoke about the great power that intellectual property rights have to shape the economy, providing drive for innovation at its best and suppressing invention at its worst. Economists have the responsibility, she said, to ensure that whatever policy is decided upon is justified rationally and economically – and can be communicated to the public and other stakeholders. The Francis Gurry lecture was established in 2009, and is named after MLS alumnus Dr Francis Gurry, who has served as the Director General of the World Intellectual Property Organization since 2008. Intellectual Property subjects can be taken as part of the Melbourne Law Masters.